You can find this classic board book in many second-hand book shops and, of course, on Amazon . This book features whimsical illustrations with a simple concept: on each page there are two animals depicting a pair of opposites. The limited text allows even non-readers to participate in "reading" the story. See the chart below for a list of the antonyms featured in this book. The added bonus of this book is that the antonym pairs are presented in a rhyming format! I primarily use this book to target opposites, but you could point out the rhymes as well. At the very least, the rhyming format gives the book a nice rhythm and predictability. See the chart below for a list of the rhymes found in this book. 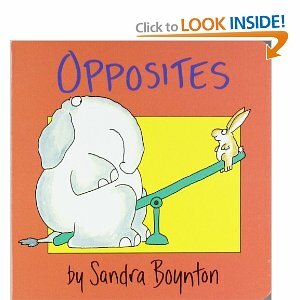 I'll introduce this book by having a student read the title, Opposites. Then I'll ask the students to recall the "fancy word" that we've been using that means the same thing... "When words have opposite or different meanings, we call them... [Antonyms!!]" Then we'll look at the cover of the book. I ask the students to come up with antonyms to describe the animals on the cover. You can help them out by giving one of the words in the pair if they need some support. "The elephant is heavy, but the rabbit is... [light]," "The elephant is large but the rabbit it... [small]," "The elephant is high, but the rabbit is... [low]," etc. Then we'll move on to reading the book. I've found a few effective ways to read this book with students and collect data. One way is to keep the book facing you, not allowing the students to see the words or pictures. Tell the students that you need their help to read the book. Add some description of the picture to provide context, and emphasize the word on the page. "The rhino is big, but the bird is -----." After the students have filled in the correct word, turn the page around for them to see the pictures. If the students needs the picture support, cover one of the words in each pair with a post-it note to elicit the antonym from the student. This way, you are using the book just as you would flashcards, but it with the added appeal of the book format. I also find that the students have fun lifting up the post-it flap to see if their guess was correct. If you've used this in therapy quite a bit and the kiddos are familiar with it, go ahead and cover all of the text with post-its. Select a students to read a page aloud, then check their guesses. I try not to spend too much time doing worksheets in the therapy room, but I am a fan of starting a worksheet, then sending it home for the student to finish. I've created an antonym crossword puzzle and word search that allow you to do just that. Use the therapy time to come up with the antonyms and write them on the blanks, then have the student fill in the crossword/find the words in the word search at home. I generally have good completion rates for worksheets started in therapy when the "fun part" is left to be done at home. Some students hate leaving work unfinished and will choose to complete it during their free time before the day is even over! I incentivize returning homework with a bonus roll in our reinforcement game (more on my reinforcement/reward strategies to come in future posts). See my Book of the Week post featuring Moose and Mouse for more ideas targeting opposites. Coming to you again are links to my antonym flash cards (cut and laminate) and I Spy Antonyms worksheet (cut into half sheets) to be used with this or any book that emphasizes word opposites. Although there are only 7 pairs of rhyming words, you can still use my Find the Rhymes worksheet (cut into half sheets) to get some practice in if you're working on this objective. I choose to laminate the worksheets and use with dry erase markers to cut down on paper waste/get kids more engaged, but printed out works fine too.